Recorded Live at California Hall, San Francisco, California, USA - July 28, 1966. Soundboard Recording :: Liberated Bootleg :: CBR 320 kbps. 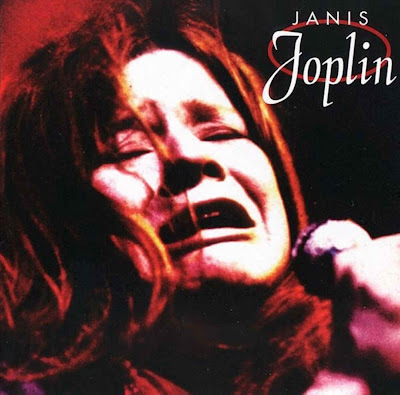 Personnel: Janis Joplin. Big Brother & The Holding Company are: Sam Andrew - Guitar :: Jim Gurley - Guitar :: Peter Albin - Bass :: Gave Getz - Drums. Notes: On this release from the tail end of the great CD bootleg era (coming outta Luxembourg right before the crackdown began there! ), Janis gets sole billing while Big Brother and the Holding Company are once again relegated to sidemen status. 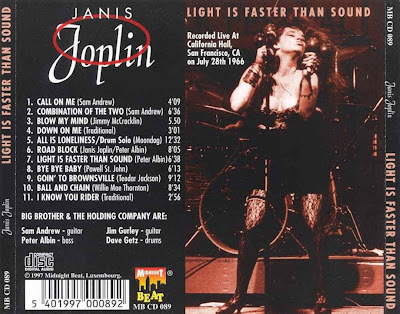 Given that this July '66 concert was recorded right when Janis had joined the group nothing could be further from the truth...if anything, at this point in the game Janis was more or less a member on equal footing with the other Brothers who were still heavily into their avant-rock and not exactly catering to Janis's caterwauling tendencies. Quality's rather good considering the now-stone aged technology of the times. (Taken from black2com.blogspot.com). Pretty sure the date on this is wrong. It's from February of 67.